This article begins a series of articles that help organizations implement a complete Azure Active Directory (Azure AD) hybrid identity solution. This solution was outlined as the Hybrid Identity Digital Transformation Framework. It covers the business outcomes and goals organizations can focus on to implement a robust and secure hybrid identity solution. The first business outcome of the framework spells out the requirements for organizations to secure the authentication process when users access cloud apps. The first business goal in the authentication secured business outcome is users' ability to sign in to cloud apps by using their on-premises usernames and passwords. This sign-in and authentication process makes everything in the cloud possible. It's the first decision for an organization that wants to move to the cloud. The authentication method is a critical component of an organization’s presence in the cloud. It controls access to all cloud data and resources. It's the foundation of all the other advanced security and user experience features in Azure AD. The authentication method is difficult to change after it's implemented. Identity is the new control plane of IT security. So authentication is an organization’s access guard to the new cloud world. Organizations need an identity control plane that strengthens their security and keeps their cloud apps safe from intruders. Organizations that don't have an existing on-premises directory footprint aren't the focus of this article. Typically, those businesses create identities only in the cloud, which doesn’t require a hybrid identity solution. Cloud-only identities exist solely in the cloud and aren't associated with corresponding on-premises identities. When the Azure AD hybrid identity solution is your new control plane, authentication is the foundation of cloud access. Choosing the correct authentication method is a crucial first decision in setting up an Azure AD hybrid identity solution. Implement the authentication method that is configured by using Azure AD Connect, which also provisions users in the cloud. To choose an authentication method, you need to consider the time, existing infrastructure, complexity, and cost of implementing your choice. These factors are different for every organization and might change over time. Azure AD supports the following authentication methods for hybrid identity solutions. Azure AD password hash synchronization. The simplest way to enable authentication for on-premises directory objects in Azure AD. Users can use the same username and password that they use on-premises without having to deploy any additional infrastructure. Some premium features of Azure AD, like Identity Protection, require password hash synchronization for no matter which authentication method you choose. Passwords are never stored in clear text or encrypted with a reversible algorithm in Azure AD. 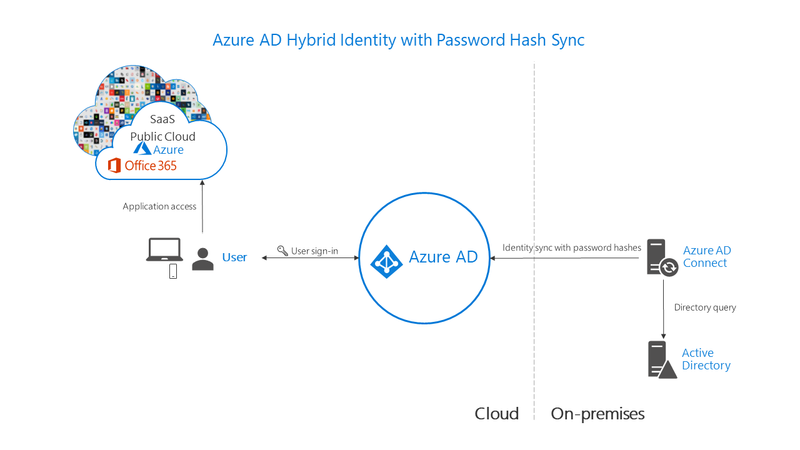 For more information on the actual process of password hash synchronization, see Implement password hash synchronization with Azure AD Connect sync. Azure AD Pass-through Authentication. Provides a simple password validation for Azure AD authentication services by using a software agent that runs on one or more on-premises servers. The servers validate the users directly with your on-premises Active Directory, which ensures that the password validation doesn't happen in the cloud. Companies with a security requirement to immediately enforce on-premises user account states, password policies, and sign-in hours might use this authentication method. For more information on the actual pass-through authentication process, see User sign-in with Azure AD pass-through authentication. When you choose this authentication method, Azure AD hands off the authentication process to a separate trusted authentication system, such as on-premises Active Directory Federation Services (AD FS), to validate the user’s password. The authentication system can provide additional advanced authentication requirements. Examples are smartcard-based authentication or third-party multifactor authentication. For more information, see Deploying Active Directory Federation Services. 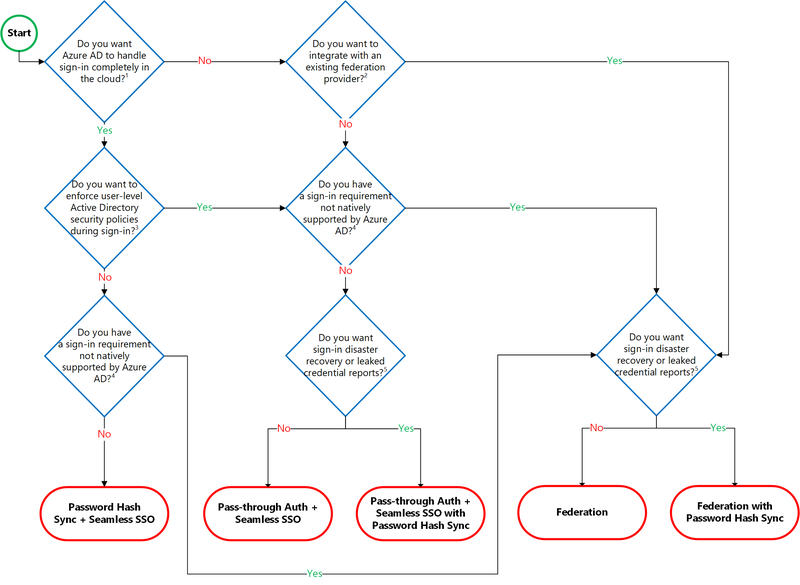 The following section helps you decide which authentication method is right for you by using a decision tree. 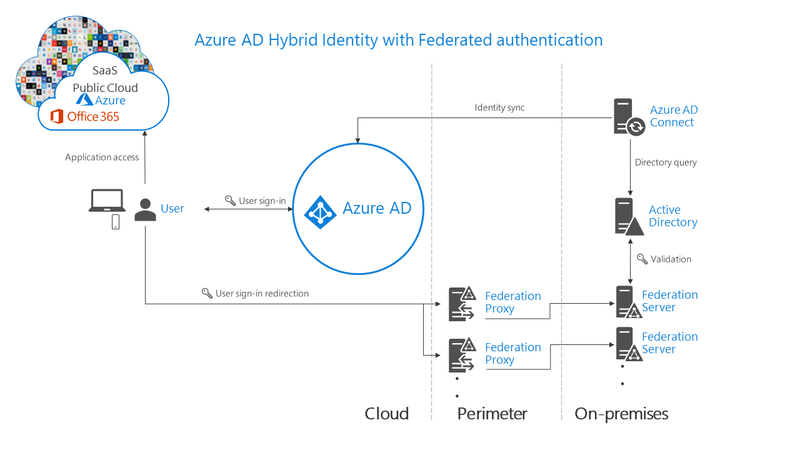 It helps you determine whether to deploy cloud or federated authentication for your Azure AD hybrid identity solution. Azure AD can handle sign-in for users without relying on on-premises components to verify passwords. Azure AD can hand off user sign-in to a trusted authentication provider such as Microsoft’s AD FS. If you need to apply user-level Active Directory security policies such as account expired, disabled account, password expired, account locked out, and sign-in hours on each user sign-in, Azure AD requires some on-premises components. Sign-in using smartcards or certificates. Sign-in using on-premises MFA Server. Sign-in using 3rd party authentication solution. Azure AD Identity Protection requires Password Hash Sync regardless of which sign-in method you choose, to provide the Users with leaked credentials report. Organizations can failover to Password Hash Sync if their primary sign-in method fails and it was configured before the failure event. Azure AD Identity Protection require Azure AD Premium P2 licenses. User experience. To improve users' sign-in experience, deploy seamless SSO with password hash synchronization. Seamless SSO eliminates unnecessary prompts when users are signed in. Advanced scenarios. If organizations choose to, it's possible to use insights from identities with Azure AD Identity Protection reports with Azure AD Premium P2. An example is the leaked credentials report. Windows Hello for Business has specific requirements when you use password hash synchronization. Organizations that require multifactor authentication with password hash synchronization must use Azure AD multifactor authentication. Those organizations can't use third-party or on-premises multifactor authentication methods. Business continuity. Using password hash synchronization with cloud authentication is highly available as a cloud service that scales to all Microsoft datacenters. To make sure password hash synchronization does not go down for extended periods, deploy a second Azure AD Connect server in staging mode in a standby configuration. Considerations. Currently, password hash synchronization doesn't immediately enforce changes in on-premises account states. In this situation, a user has access to cloud apps until the user account state is synchronized to Azure AD. Organizations might want to overcome this limitation by running a new synchronization cycle after administrators do bulk updates to on-premises user account states. An example is disabling accounts. The password expired and account locked-out states aren't currently synced to Azure AD with Azure AD Connect. Refer to implementing password hash synchronization for deployment steps. Effort. For pass-through authentication, you need one or more (we recommend three) lightweight agents installed on existing servers. These agents must have access to your on-premises Active Directory Domain Services, including your on-premises AD domain controllers. They need outbound access to the Internet and access to your domain controllers. For this reason, it's not supported to deploy the agents in a perimeter network. Pass-through Authentication requires unconstrained network access to domain controllers. All network traffic is encrypted and limited to authentication requests. For more information on this process, see the security deep dive on pass-through authentication. User experience. To improve users' sign-in experience, deploy seamless SSO with Pass-through Authentication. Seamless SSO eliminates unnecessary prompts after users sign in. Advanced scenarios. Pass-through Authentication enforces the on-premises account policy at the time of sign in. For example, access is denied when an on-premises user’s account state is disabled, locked out, or password expired or falls outside the hours when the user is allowed to sign in. Organizations that require multifactor authentication with pass-through authentication must use Azure Multi-Factor Authentication (MFA). Those organizations can't use a third-party or on-premises multifactor authentication method. Advanced features require that password hash synchronization is deployed whether or not you choose pass-through authentication. An example is the leaked credentials report of Identity Protection. Business continuity. We recommend that you deploy two extra pass-through authentication agents. These extras are in addition to the first agent on the Azure AD Connect server. This additional deployment ensures high availability of authentication requests. When you have three agents deployed, one agent can still fail when another agent is down for maintenance. There's another benefit to deploying password hash synchronization in addition to pass-through authentication. It acts as a backup authentication method when the primary authentication method is no longer available. Considerations. You can use password hash synchronization as a backup authentication method for pass-through authentication, when the agents can't validate a user's credentials due to a significant on-premises failure. Failover to password hash synchronization doesn't happen automatically and you must use Azure AD Connect to switch the sign-on method manually. For other considerations on Pass-through Authentication, including Alternate ID support, see frequently asked questions. Refer to implementing pass-through authentication for deployment steps. Effort. A federated authentication system relies on an external trusted system to authenticate users. Some companies want to reuse their existing federated system investment with their Azure AD hybrid identity solution. The maintenance and management of the federated system falls outside the control of Azure AD. It's up to the organization by using the federated system to make sure it's deployed securely and can handle the authentication load. User experience. The user experience of federated authentication depends on the implementation of the features, topology, and configuration of the federation farm. Some organizations need this flexibility to adapt and configure the access to the federation farm to suit their security requirements. For example, it's possible to configure internally connected users and devices to sign in users automatically, without prompting them for credentials. This configuration works because they already signed in to their devices. If necessary, some advanced security features make users' sign-in process more difficult. Authentication that requires smartcards or certificates. On-premises MFA servers or third-party multifactor providers. Authentication by using third-party authentication solutions. See the Azure AD federation compatibility list. Sign in that requires an sAMAccountName, for example, DOMAIN\username, instead of a User Principal Name (UPN), for example, user@domain.com. Business continuity. Federated systems typically require a load-balanced array of servers, known as a farm. This farm is configured in an internal network and perimeter network topology to ensure high availability for authentication requests. Deploy password hash synchronization along with federated authentication as a backup authentication method when the primary authentication method is no longer available. An example is when the on-premises servers aren't available. Some large enterprise organizations require a federation solution to support multiple Internet ingress points configured with geo-DNS for low-latency authentication requests. Considerations. Federated systems typically require a more significant investment in on-premises infrastructure. Most organizations choose this option if they already have an on-premises federation investment. And if it's a strong business requirement to use a single-identity provider. Federation is more complex to operate and troubleshoot compared to cloud authentication solutions. For a nonroutable domain that can't be verified in Azure AD, you need extra configuration to implement user ID sign in. This requirement is known as Alternate login ID support. See Configuring Alternate Login ID for limitations and requirements. If you choose to use a third-party multi-factor authentication provider with federation, ensure the provider supports WS-Trust to allow devices to join Azure AD. Refer to Deploying Federation Servers for deployment steps. When you deploy your Azure AD hybrid identity solution, you must implement one of the supported topologies of Azure AD Connect. Learn more about supported and unsupported configurations at Topologies for Azure AD Connect. 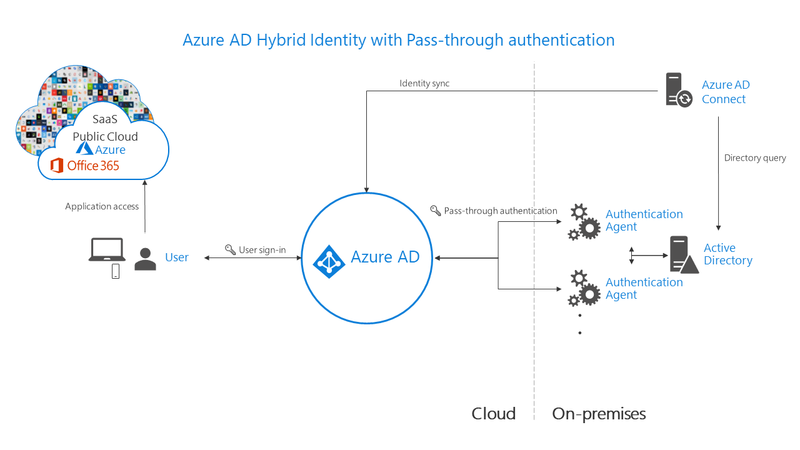 The following diagrams outline the high-level architecture components required for each authentication method you can use with your Azure AD hybrid identity solution. They provide an overview to help you compare the differences between the solutions. Custom controls in Azure AD conditional access does not currently support device registration. Your identity system ensures your users' access to cloud apps and the line-of-business apps that you migrate and make available in the cloud. To keep authorized users productive and bad actors out of your organization’s sensitive data, authentication controls access to apps. High availability and disaster recovery. Pass-through Authentication and federation rely on on-premises infrastructure. For pass-through authentication, the on-premises footprint includes the server hardware and networking the Pass-through Authentication agents require. For federation, the on-premises footprint is even larger. It requires servers in your perimeter network to proxy authentication requests and the internal federation servers. To avoid single points of failures, deploy redundant servers. Then authentication requests will always be serviced if any component fails. Both pass-through authentication and federation also rely on domain controllers to respond to authentication requests, which can also fail. Many of these components need maintenance to stay healthy. Outages are more likely when maintenance isn't planned and implemented correctly. Avoid outages by using password hash synchronization because the Microsoft Azure AD cloud authentication service scales globally and is always available. Organizations that previously turned on password hash synchronization changed their authentication method to use password hash synchronization. They were back online in a matter of hours. By using access to email via Office 365, they worked to resolve issues and access other cloud-based workloads. Organizations that didn’t previously enable password hash synchronization had to resort to untrusted external consumer email systems for communications to resolve issues. In those cases, it took them weeks to restore their on-premises identity infrastructure, before users were able to sign-in to cloud-based apps again. Identity protection. One of the best ways to protect users in the cloud is Azure AD Identity Protection with Azure AD Premium P2. Microsoft continually scans the Internet for user and password lists that bad actors sell and make available on the dark web. Azure AD can use this information to verify if any of the usernames and passwords in your organization are compromised. So it's critical to enable password hash synchronization no matter what authentication method you use, whether that's federated or pass-through authentication. Leaked credentials are presented as a report. Use this information to block or force users to change their passwords when they try to sign in with leaked passwords. Lastly, according to Gartner, Microsoft has the most full-featured set of identity and access management functions. Microsoft handles 450 billion authentication requests every month to provide access to thousands of SaaS applications like Office 365 from virtually any device. This article outlines various authentication options that organizations can configure and deploy to support access to cloud apps. To meet various business, security, and technical requirements, organizations can choose between password hash synchronization, Pass-through Authentication, and federation. Consider each authentication method. Does the effort to deploy the solution, and the user's experience of the sign-in process, address your business requirements? Evaluate whether your organization needs the advanced scenarios and business continuity features of each authentication method. Finally, evaluate the considerations of each authentication method. Do any of them prevent you from implementing your choice? In today’s world, threats are present 24 hours a day and come from everywhere. Implement the correct authentication method, and it will mitigate your security risks and protect your identities. Get started with Azure AD and deploy the right authentication solution for your organization. If you're thinking about migrating from federated to cloud authentication, learn more about changing the sign-in method. To help you plan and implement the migration, use these project deployment plans.